In the lead up to the 2016 Olympics in Brazil, global news attention has focused on the impact of the Zika virus in the country, including efforts to halt the spread of the mosquito-borne virus across Latin America, the Caribbean, and other regions. People who contract Zika are unlikely to experience symptoms. Those who do develop signs of infection experience a few days of body aches, rash, and fever, though in some cases there are more severe neurological and autoimmune effects. For many experts, this makes the Zika virus a potentially less serious public health problem than the lethal mosquito-transmitted pandemics of malaria and dengue. Yet it is the special risk to infants that has galvanized worldwide attention. Among pregnant women, contracting Zika increases the risk of birth defects, including microcephaly, in which an infant’s head and brain do not fully develop. In Brazil, there have been more than 5,000 confirmed cases of microcephaly associated with Zika. Summertime temperatures are likely to bring to the United States the first non–travel-related cases of Zika. The mosquito species that is the primary carrier of the virus ranges across the South and Southwest and stretches into states including Maryland, West Virginia, Kentucky, New Jersey, and parts of New York. But outbreaks in the United States are likely to be limited compared to other countries. Better housing, window screens, and air conditioning are far more common than in poorer countries, and the states that are most likely to be affected have substantial experience in preventing and containing such diseases. Still, the public opinion dynamics surrounding the past pandemics of swine flu and Ebola suggest that worry among Americans is likely to escalate, intensifying across summer months and into the fall. Concern will be driven not only by saturation news coverage of the Olympics and a possible outbreak in the United States but also by a highly polarized presidential election campaign. In spring 2009, the first cases of swine flu were reported in Mexico with other cases soon identified in the United States and around the world. By June 2009, the World Health Organization (WHO) announced that the swine flu outbreak was the first worldwide pandemic in forty years. When, several months later, an emergency vaccine was made available to the American public, whether or not an individual said they planned to be vaccinated depended strongly on their partisan outlook and their trust in government. At the outset of the pandemic, surveys indicated that swine flu had quickly come to dominate Americans’ attention, as 82 percent of Americans said they were following the story, making the pandemic one of the most followed news stories of the year. At the time, it was also the most followed story about infectious disease in history, topping SARS, West Nile Virus, and mad cow disease, though swine flu would soon be eclipsed in 2014 by Ebola virus (see Figure 1) (Pew 2009a). The amount of public attention to swine flu during spring 2009 was not surprising given that a third of total news coverage across media outlets focused on the virus. No other issue came close. Even the still-faltering economy captured only 10 percent of total news coverage. Later that year in October, public attention spiked again as news coverage focused on the public availability of a vaccine (Pew 2009a; 2009b). But efforts to offer the vaccine to the public soon became politically controversial, as misleading claims about safety spread by way of talk radio and social media, leading many Americans to say they would forego vaccinations (Steinhauer 2009). In the context of these false claims, there were strong differences in public perceptions. Half of Republicans said news reports were overstating swine flu’s danger, compared to 35 percent of Democrats (Pew 2009a). More troubling, only 41 percent of Republicans said they would get vaccinated, compared to 60 percent of Democrats (Pew 2009a). Further analysis showed that trust in government was ultimately the key driver of decisions to be vaccinated. In contrast to their Democratic counterparts, Republicans were less likely to believe that the Obama administration could handle the swine flu problem, and as a consequence, were less likely to say that they were willing to take the vaccine (Mesch and Schwirian 2015). In December 2013, the first Ebola epidemic in history broke out in West Africa. By mid-2014, the epidemic had dramatically intensified. From July 2014 to October 2014, monthly reported cases in Guinea and Sierra Leone increased from 500 in each country to a peak of nearly 3,000. By January 2016, when the WHO declared the epidemic officially over, there had been more than 28,000 reported cases in West Africa and 11,300 confirmed deaths. In the United States, there were a total of four confirmed Ebola cases and one related death. Yet by early October 2014, despite little to no risk of contracting the disease, 32 percent of the U.S. public said they were very or somewhat worried about Ebola. Two weeks later, as media attention to the epidemic intensified, worry had spread to 41 percent of the public. 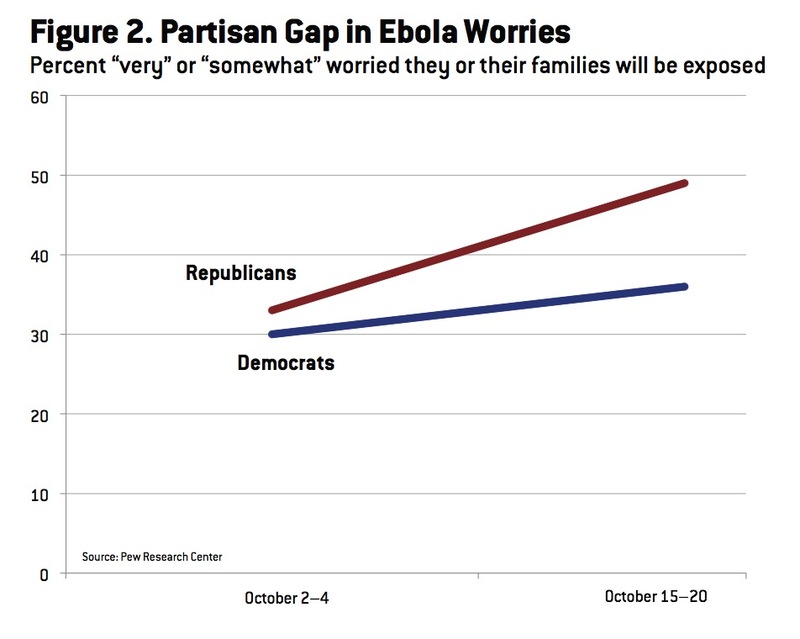 At the start of the month, Americans regardless of partisan identity expressed similar levels of worry. But two weeks later, worry among self-identified Republicans had grown from 33 percent to 49 percent. In comparison, worry among self-identified Democrats had shifted more modestly from 30 percent to 36 percent (see Figure 2) (Pew 2014). In mid-October 2014, at the peak of concern, a review of polls shows that about half of the public (45 percent) said they were either very or somewhat worried that they or their family would become sick with Ebola. Fears of infection subsequently declined as no other U.S. cases were reported. Still, by November 2014, Americans ranked Ebola as the third most urgent health problem facing the country, just below cost and access to health care and ahead of cancer and heart disease (which combined to account for nearly half of all U.S. deaths annually; see SteelFisher et al. 2015). A review of polling evidence suggests several key factors that led to a public fear over Ebola that was substantially out of proportion to the actual nature of the threat. First, surveys indicate that false beliefs about Ebola were widespread. For example, Ebola is not airborne and is not contagious until someone shows symptoms. Yet 85 percent of Americans believed that if sneezed or coughed on by a symptomatic individual, a person is either very likely or somewhat likely to get Ebola (SteelFisher et al. 2015). A second factor was the saturation nature of news coverage particularly on network TV and cable news. By one tally, CNN, NBC, and CBS aired nearly 1,000 evening news segments about Ebola between mid-October and early November. The personalization of coverage around the two American nurses and one doctor who were infected with Ebola at the expense of more contextual, thematic coverage likely helped intensify public concern (SteelFisher et al. 2015). Cable news and talk radio also framed the U.S. government’s response to Ebola in strongly political and partisan terms, making it easy for Republicans and others who disliked the Obama administration to discount reassurances from health officials that there was little need to worry. Like in the case of swine flu, a third related factor was public confidence in the government. Although 57 percent of the public said they had a great deal or fair amount of confidence in the government to prevent an Ebola outbreak, there were predictably strong partisan differences in opinion. By mid-October, 67 percent of Democrats said they had confidence in the government compared to only 41 percent of Republicans who said the same (Pew 2014; SteelFisher et al. 2015). As of spring 2016, similar public opinion dynamics to swine flu and Ebola were already observable in the case of Zika. Public attention quickly spiked in reaction to news of the threat. Nearly 60 percent of Americans in February 2016 said they were following news about Zika either very closely or fairly closely (DiJulio et al. 2016). At the same time, public knowledge was low. Though nine out of ten Americans knew that the virus spread by mosquitoes, 40 percent did not know the virus could be sexually transmitted, and 31 percent incorrectly believed that the virus could be transmitted through coughing and sneezing (Joseph 2016). By March 2016, 68 percent said they were familiar with news reports of the issue and 50 percent said that the issue concerned them. Much of this concern, however, was likely rooted in false beliefs, as 42 percent thought incorrectly that it was likely someone would die from Zika if infected, and that the mosquito that carries the disease could be found in every state (Annenberg 2016). As news coverage of Zika increases leading up to the Olympics and as the first cases are reported in the United States, the presidential election campaign is likely to intensify political conflict over Federal funding for prevention and possible limits on immigration. In this context, false claims and misinformation are likely to rapidly spread, and partisan messaging is likely to be strong. It would not be surprising, then, for Democrats and Republicans to start to split in their perceptions of the threat, in their trust in the response of government agencies, and in their support for different types of policy actions. In this new era of partisan pandemics, public health officials need to expand their investment in localized and regional communication strategies that can effectively reach the public below the level of national political debate. This includes building relationships with local media and opinion leaders, and the capacity to rapidly respond to misinformation. The expert community should also continue to cultivate strong relationships with leaders across the political spectrum, including respected nonpartisan voices such as military and faith-based leaders who can affirm expert consensus on the nature of the risks and what is needed in response (see SteelFisher et al. 2015). Annenberg Public Policy Center. 2016. More Than 4 in 10 Mistakenly Think Zika Is Fatal, Symptoms Are Noticeable. Available online at http://www.annenbergpublicpolicycenter.org/more-than-4-in-10-mistakenly-think-zika-is-fatal-and-symptoms-are-noticeable/. DiJulio, B., J. Firth, A. Kirzinger, et al. 2016. Kaiser Health Tracking Poll: February 2016. Washington, DC: Henry J. Kaiser Family Foundation. Available online at http://kff.org/global-health-policy/poll-finding/kaiser-health-tracking-poll-february-2016/. Joseph, A. 2016. 1 in 3 Americans think you can catch Zika from a sneeze. STAT News (March 29). Available online at https://www.statnews.com/2016/03/29/zika-poll/. Mesch, G.S., and K.P. Schwirian. 2015. Social and political determinants of vaccine hesitancy: Lessons learned from the H1N1 pandemic of 2009–2010. American Journal of Infection Control 43(11): 1161–1165. Pew Research Center. 2009a. Local TV A Top Source for Swine Flu News. Available online at http://www.people-press.org/2009/05/06/local-tv-a-top-source-for-swine-flu-news/. ———. 2009b. Growing Interest in Swine Flu, Many See Press Overstating its Danger. Available online at http://www.people-press.org/2009/10/15/growing-interest-in-swine-flu-many-see-press-overstating-its-danger/. ———. 2014. Most Are Confident in Government’s Ability to Prevent Major Ebola Outbreak in U.S. Available online at http://www.people-press.org/2014/10/06/most-are-confident-in-governments-ability-to-prevent-major-ebola-outbreak-in-u-s/. SteelFisher, G.K., R.J. Blendon, and N. Lasala-Blanco. 2015. 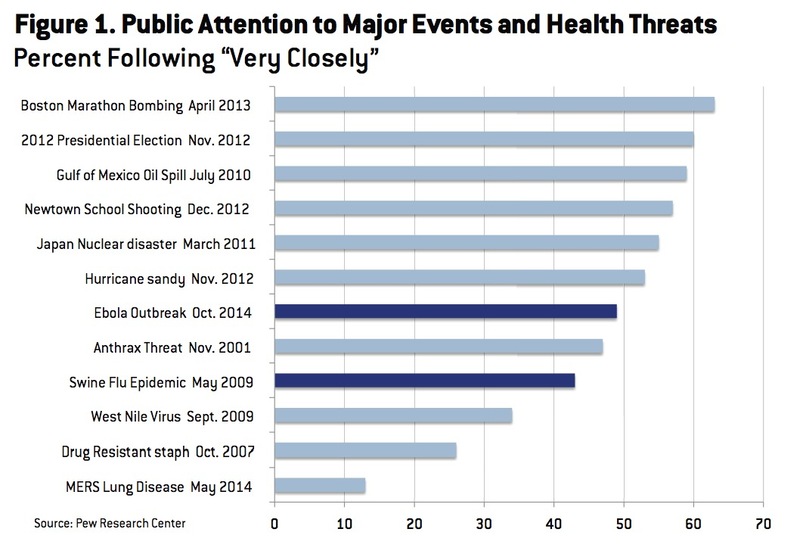 Ebola in the United States—Public reactions and implications. New Eng­land Journal of Medicine 373(9): 789–791. Steinhauer, J. 2009. Swine flu shots revive a debate. New York Times (October 16): A1. Available online at http://www.nytimes.com/2009/10/16/health/16vaccine.html.